That the wind industry is responsible for havoc and chaos is not news to STT followers, but normally it’s rocketing power prices, wrecking power markets and grids and ruining communities that springs to mind. In this case, the mayhem arose even before the blades started spinning in some dimwit’s back paddock. A lorry was crushed by the blade of a 62m wind turbine which went spinning across the German autobahn after a transporter truck crashed. 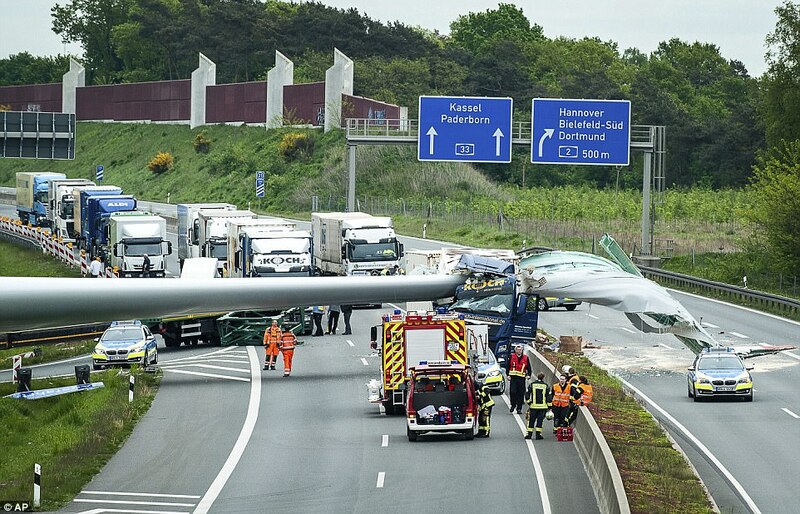 Autobahn 33 was closed just outside Bielefeld, between Hanover and Dortmund, when the truck carrying the 16-ton wind turbine was rear-ended by another vehicle. 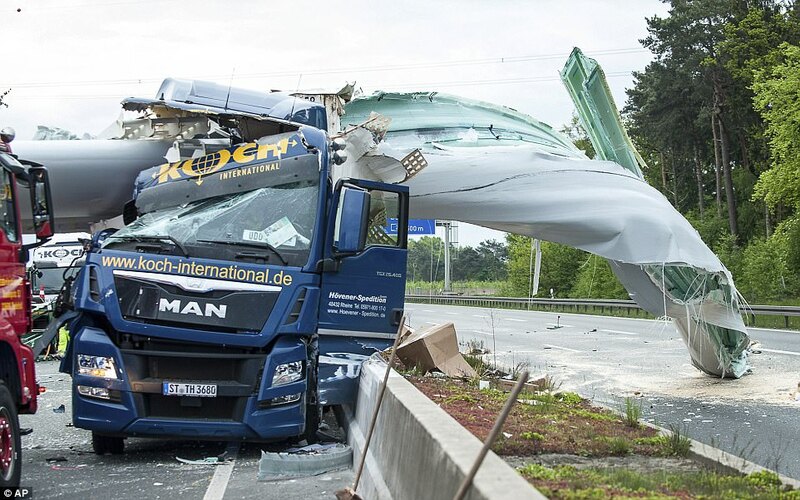 It sent the enormous blade across the carriageway where it ploughed into vehicles and a lorry belonging to cargo logistics company Koch International – which is based just 34 miles away from the incident in Osnabrück – was left completely destroyed. The €520,000 piece of equipment was on its way to a wind farm in Hasselbach in Bielefeld-Eckardtsheim when the collision occurred on a slip-road this morning. 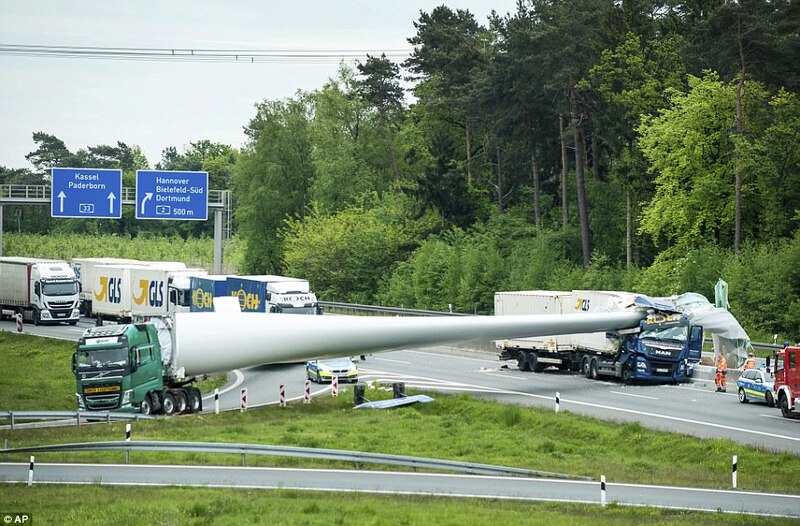 The incident on Tuesday morning was made worse by the lorry that hit the back of the transporter truck shunting the turbine across the whole width of the motorway, according to Rheinische Post. In the process, the cabin was badly damaged and the driver sustained injuries when the vehicle he was driving was left mangled. Police immediately closed down the autobahn in both directions which led to huge backlogs on the busy stretch of road. Because of the size of the rotor blade, it will have to be sawn into pieces in order for two cranes to lift them off the road, according to Westfalen Blatt. As the transporter tried to leave the motorway, a lorry crashed into the back of it on the slip-road. A third truck tried to swerve the enormous blade, but only managed to crash into it, sending it hurtling across the other side of the carriageway. Here, a truck coming from the opposite direction smashed straight into it, and the driver was left with serious injuries. The driver of the third truck was also hurt, but only sustained minor injuries. The truck was crushed, the driver walked away. No he didn’t, he sustained serious injuries as a result of being crushed in his cabin. Perhaps you are reading a different story?